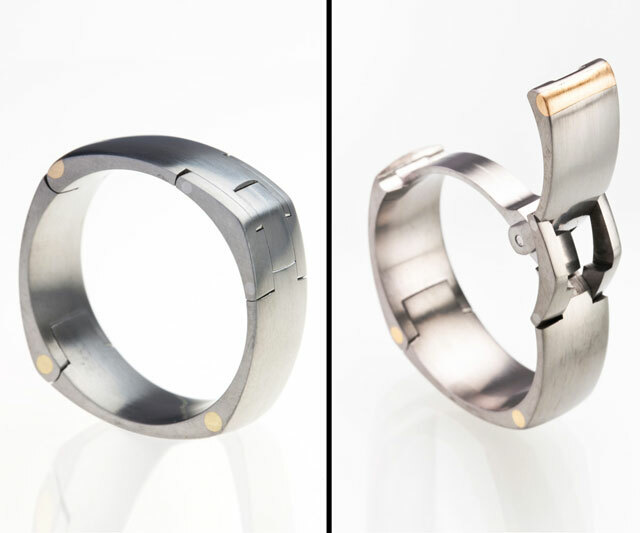 Jeff McWhinney designs wedding rings for men who move. Like a little more than from their desk to the john, the car to the house, and the couch to the fridge. Hikers, golfers, climbers, weight lifters, even really intense grill masters probably find wearing a wedding ring during active pursuits constricting and uncomfortable. Do your hands swell and bulge around the band? Did you get a size larger than you need because you have girthy knuckles? Do you find removing your ring prior to athletic endeavors--or even to shower--takes as much effort as the endeavor itself? McWhinney's highly-engineered designs focus on making life for the fingers of men with active lifestyles a little easier. Each Active Ring in the McWhinney series has a hinged opening mechanism for easy removal. 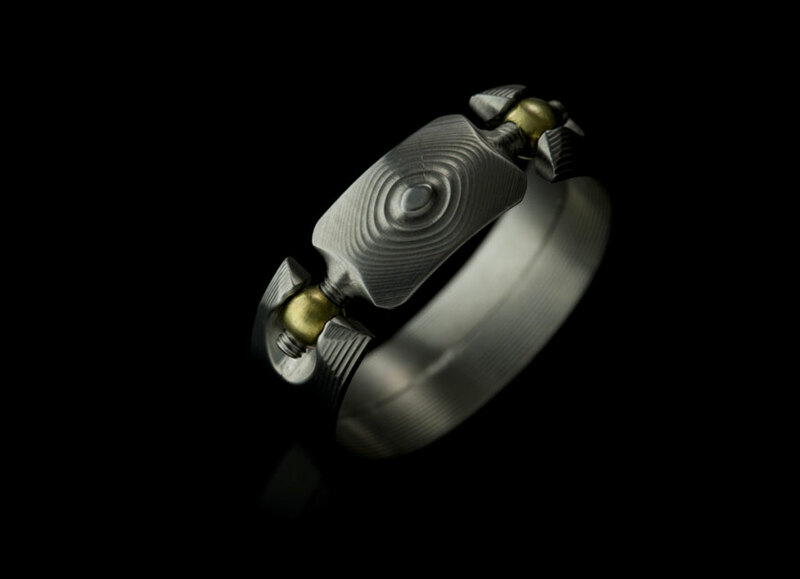 Precise mechanisms vary slightly, but all feature a top segment that flips upward, enabling wearers to widen their bands, and creating either a large enough circumference that they can easily slide their fingers out, or a gap large enough for pulling the rings down and off. Additionally, rings have been crafted to maintain a smooth cross-section and naked feel during wear. Men shouldn't notice the seams, and they won't catch on errant shirt threads or during common movements such as sliding hands in and out of pockets. All McWhinney ring designs are created and tested first as 3D CAD models. Following approval, the artist machines them from a billet chunk of titanium using miniature carbide cutting tools on a Haas 4-Axis CNC mill outfitted with an ultra-precision 30,000-RPM spindle. Yeah, I got lost after "titanium" too, but it all sounds very high-tech and manly. 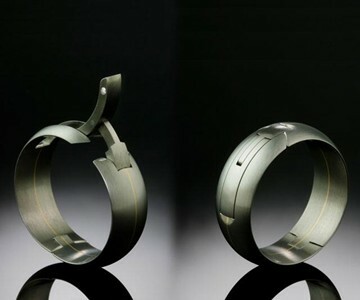 Rings' functional parts are made from aircraft grade 6-4 hypoallergenic titanium, and linkage pivots are either stainless steel or machined directly into the titanium parts. 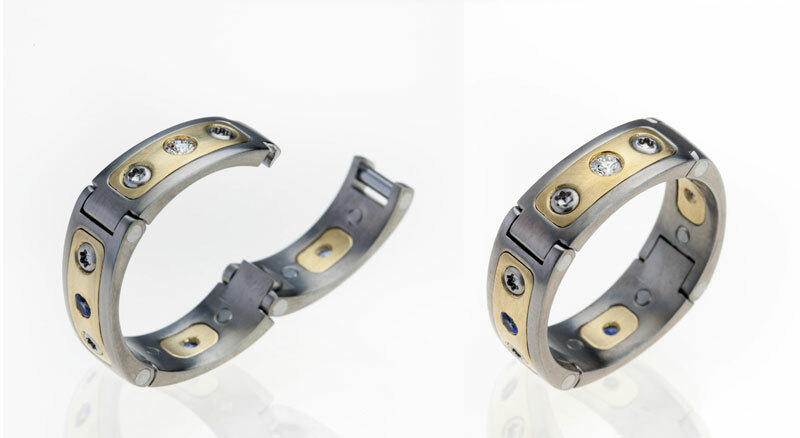 Some designs, such as the JJ-1 ($3,750) also incorporate 18K yellow gold and gemstones. Custom options of stainless steel, mokume-gane, and high-tensile platinum are available too. At printing, McWhinney was offering 6 bands in his Active Rings collection.